A stunning black shade pendent chandelier trimmed with spotless smoke crystals to add an elegant touch to every home. D:20" x H:12" - 48"
Height is adjustable between 12"-48"
This breathtaking 12 Light Chandelier with Chrome Finish is a beautiful piece from our Claire Collection. With its sophisticated beauty and stunning details, it is sure to add the perfect touch to your dicor. This breathtaking 6 Light Chandelier with Black Finish and Clear Crystals is a beautiful piece from our Mira Collection. With its sophisticated beauty and stunning details, it is sure to add the perfect touch to your dicor. 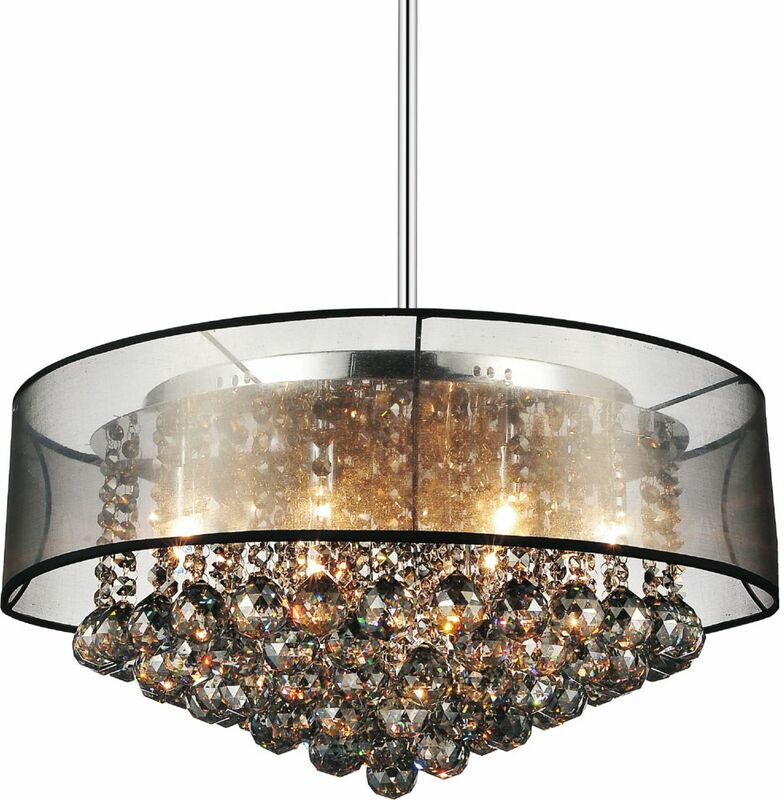 This breathtaking 3 Light Chandelier with Black Silver Finish is a beautiful piece from our Monroe Collection. With its sophisticated beauty and stunning details, it is sure to add the perfect touch to your dicor. This breathtaking LED Chandelier with Black + Chrome Finish is a beautiful piece from our Trail Collection. With its sophisticated beauty and stunning details, it is sure to add the perfect touch to your dicor. 20-inch Round Pendant Chandelier with Black Shade A stunning black shade pendent chandelier trimmed with spotless smoke crystals to add an elegant touch to every home. 20-inch Round Pendant Chandelier with Black Shade is rated 5.0 out of 5 by 2. Rated 5 out of 5 by Vicd from Gorgeous chandelier This chandelier looks amazing over our dining table. The colours from the glass are beautiful. Only recommendation is to get lower wattage bulbs as it was a bit to bright. Definitely recommend this fixture!